Couple named 2017 Man and Woman of the Year by Emerald Ladies’ Journal. The award recognizes an outstanding male and female who’ve shown exemplary leadership, involvement, and service in their community. 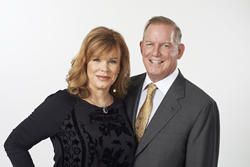 Isagenix International, a global health and wellness company providing nutrition and lifestyle solutions, is pleased to announce that Owner and Board Member Jim Pierce and his wife, Tammy, have been named 2017 Man & Woman of the Year by Emerald Ladies’ Journal. The award recognizes an outstanding male and female who’ve shown exemplary leadership, involvement, and service in their community. The Pierces, who live on the Emerald Coast in Florida, work with multiple charitable organizations. Among the many organizations the Pierces help is Make-A-Wish®, a nonprofit that grants wishes of children with life-threatening medical conditions. In 2012, Jim introduced the idea of Isagenix supporting Make-A-Wish, resulting in a tremendous partnership. Over the past five years, Isagenix and its customers and employees have donated over $7.3 million and helped grant 800 wishes to children with serious illnesses. The Pierces also support Food For Thought in Florida, a not-for-profit that provides backpacks filled with healthy, easy-to-prepare food to students who are dependent on free or reduced school meals. This food helps bridge the gap between school meals during weekends and holiday breaks. Another organization that benefits from the Pierces’ generosity is the Emerald Coast Children’s Advocacy Center in Florida, a nonprofit that works to prevent child abuse and neglect, protect children, and restore the lives and futures of affected children. The center’s new location in DeFuniak Springs, Florida, is named the Pierce Family Children’s Advocacy Center. This honor is especially meaningful for Jim, a child abuse survivor who left home at 16 and supported himself through his remaining high school years. Travis Ogden, Isagenix president and chief operating officer, was thrilled that the Pierces were named Man & Woman of the Year. Established in 2002, Isagenix provides systems for weight loss, energy, performance, healthy aging, and wealth creation. With more than 550,000 customers worldwide and more than 100 life-changing products, packs, and systems globally, the company is committed to producing Solutions to Transform Lives™. In 2017, Isagenix surpassed $5 billion in cumulative global sales through an independent network of associates in the U.S., Canada, Puerto Rico, Hong Kong, Australia, New Zealand, Taiwan, Mexico, Singapore, Malaysia, Colombia, Indonesia, the United Kingdom, Ireland, and the Netherlands. Isagenix is a privately owned company with headquarters in Gilbert, Arizona. For more information, visit Isagenix.com.